This is an important week for House of Tides. The “casual fine dining” establishment, which opened on Newcastle’s Quayside exactly one year ago, is marking its anniversary with a pretty radical change of direction. 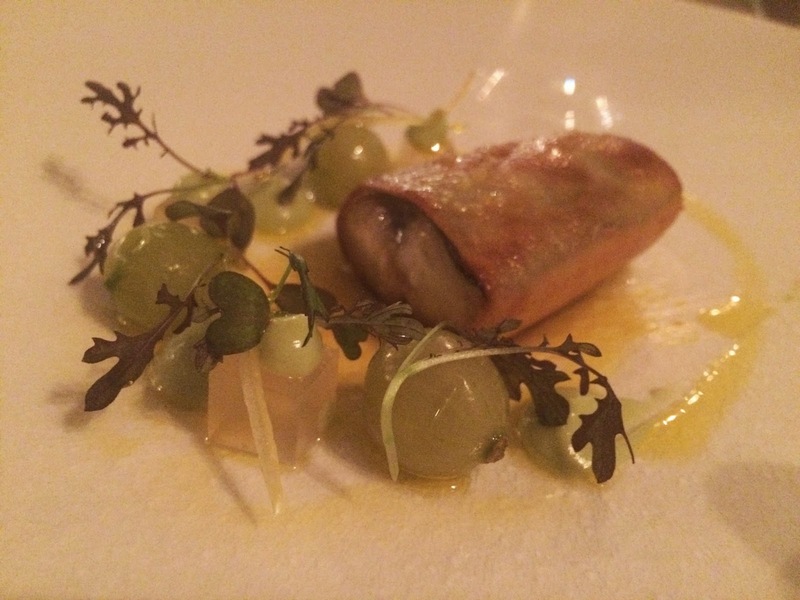 Despite warmly welcoming its arrival, along with everyone else who cares about good food in our City, I was fairly hard on the place in my last review. 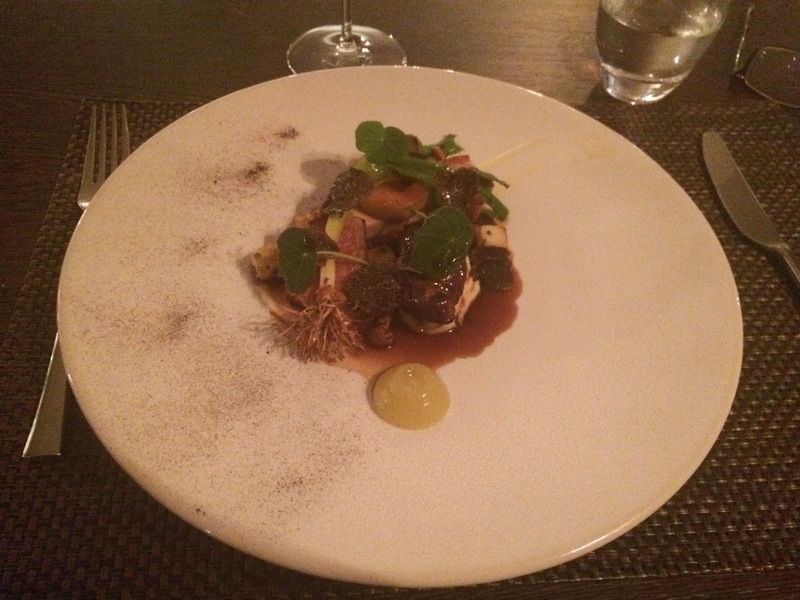 There was no doubt that Kenny Atkinsons’s cooking is exemplary, but I was worried about how viable the place would be with just a tasting menu. Could he encourage loyalty from local foodies with one menu entitled Winter? – last February seemed an awful long way from Spring. I also questioned the depth of talent in the kitchen – when Kenny cooked, everything was gorgeous, but how would the brigade cope in his absence? The third, and most obvious problem, was the breathtakingly inept service. With a cloying maître d’ and poorly trained staff, front of house really let the side down. But that’s all water under the Tyne Bridge. At Kenny Atkinson’s invitation, I returned to celebrate the restaurant’s birthday and I’m delighted to report that House of Tides enters its second year in excellent shape. Service is now immaculate, efficient, informed, led by the charming Laura Stephenson and a sommelier called Will Dennison; in the kitchen Danny Parker has been promoted to head chef – he came perilously close to winning Masterchef a few weeks back and can clearly cope with whatever Chef Atkinson throws at him; best of all, from next week there’s an enticing new slate of menus. From Wednesday to Friday they’ll be serving lunch with two courses for £20, as well as two separate tasting menus (£35 and £65). These are also served on Tuesday to Friday evenings, with the market menu costing £38. 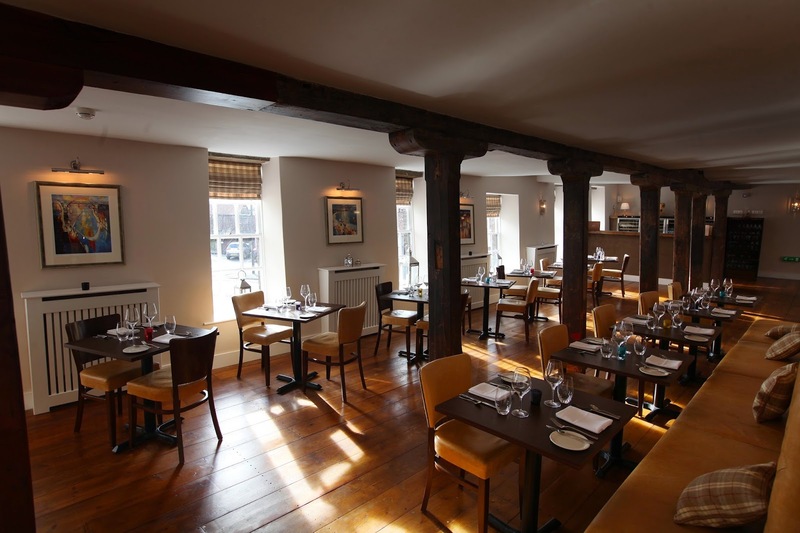 Saturday evening tables are fully booked months in advance, when he just offers the “Prestige” menu at £65 a head. There’s also a set of vegetarian dishes – surely enough choice to keep any foodie amused. 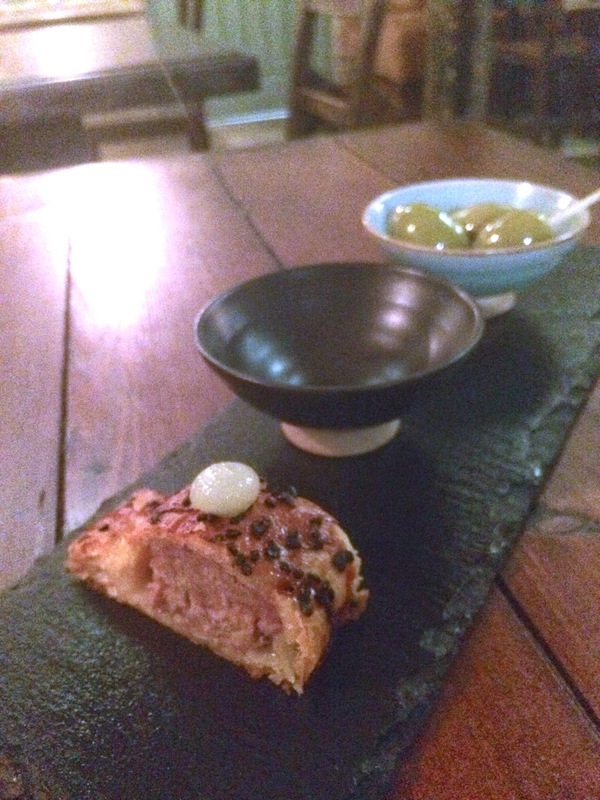 Pre-dinner drinks in the bar are more informal than before, with giant olives and a cumin-spiced sausage roll, like a bar snack parody, replacing the amuse-bouches accompanying my Albariño, before heading to the tables upstairs. “This is lamb pancreas,” announced my waitress, as she presented me with my first dish: a little roll of something in an orange-coloured sauce. 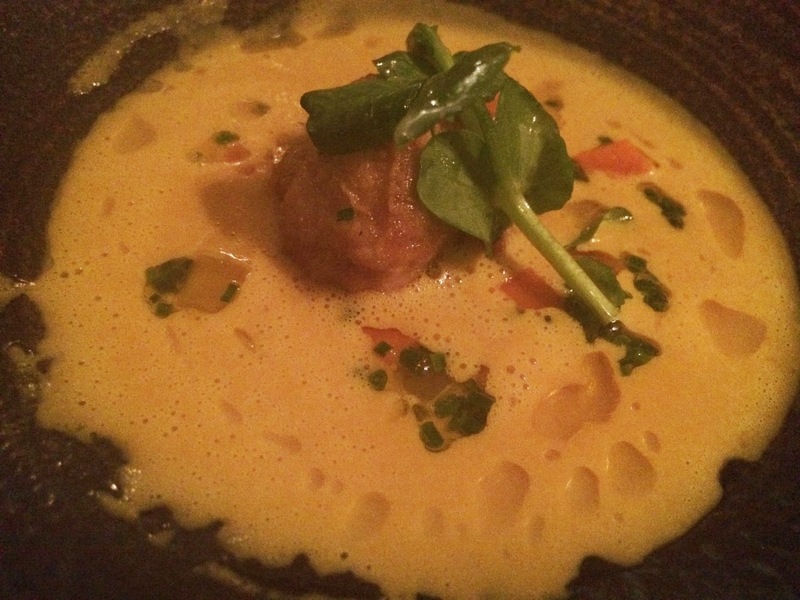 Ris d’agneau sounds more palatable – sweetbread to you and me – but this milky, rich delicacy, surrounded by a velouté of carrot, in which floated tiny sharp cubes of pickled carrot, was an unusual and special starter. 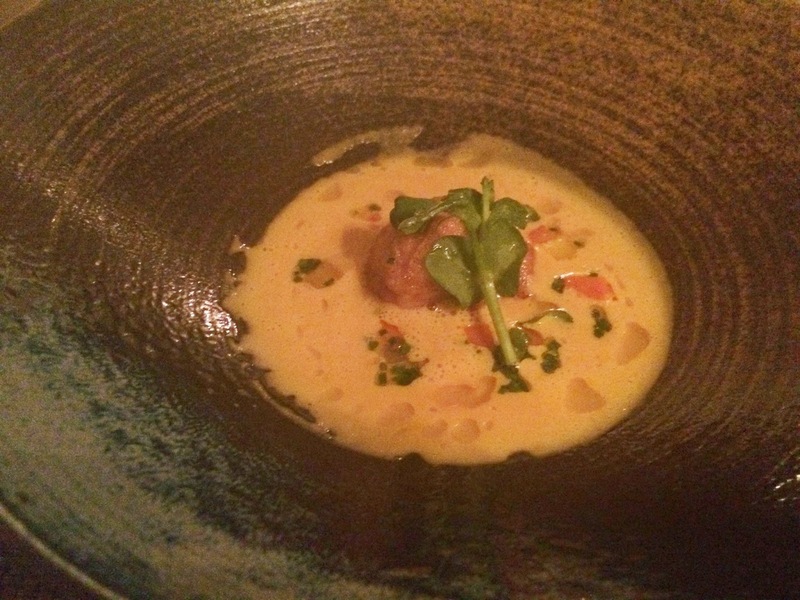 I wasn’t convinced by the velouté, which rather swamped the subtle sweetbread. Will brought me a treat of a Riesling from Washington State. He didn’t look much like a sommelier: while the waiting staff were dressed in formal black and grey, Will looked like he’d stepped out of a posh houseparty, with sports jacket, open shirt and smart brown brogues, like the youngest son of the baronet who keeps the aged aunts amused while helping out with supper. He seemed to know his stuff, though, and put together a very credible wine pairing. We moved to cod and confited chicken wings, with wild pieds de bleu mushrooms, a terrific combination, before the Atkinson signature dish: mackerel rolled in bread, with small, sharp baby gooseberries (the waitress tried to tell me they were fresh, but not even Ken Holland can grow gooseberries this time of year, and the freezer had intensified the taste to almost sourness, a great foil for the oily fish), with a delicious gooseberry jelly and a sauce of English mustard and lemon, to which Will had correctly added a glass of Vouvray. 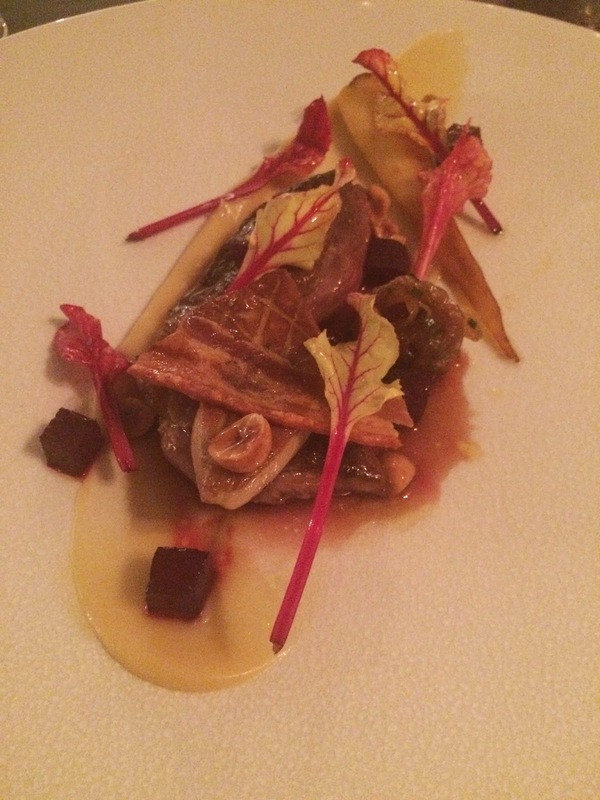 A glass of Côte de Beaune (from Saint-Aubin) proclaimed the arrival of meat – tender Norfolk quail, poached in its own juices with butter, and some melting foie gras under a triangle of pancetta, with little crunchy cubes of beet, baby beet leaves, parsnip purée, hazlenuts, strands of confited orange and thin slices of chicory. 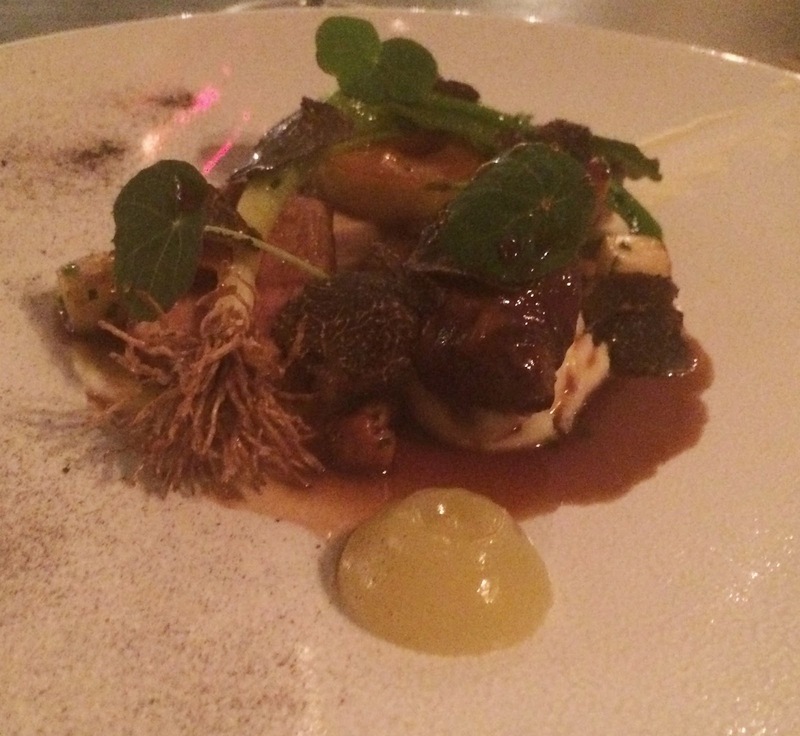 This was confident, classical cooking, not uncomplicated but utterly uncluttered. It was beautiful, balanced and perfectly executed. There followed three cuts of pork: belly, tenderloin and deep, melting cheek, sitting on pomme purée. There was winter truffle, a ring of spiced apple, together with some nice puréed Bramley, cubes of celeriac and a whole baby leek, complete with crispy roots. Faultless cooking, cleverly combined. At this point Atkinson himself appeared in the restaurant, not to chat, but to supervise the construction of desserts, which are put together in front of the customers, for lack of kitchen space downstairs. My pre-dessert was a sort of delicious rhubarb trifle, with zingy jelly, the freshest champagne rhubarb stalks, a spicy ginger crumb, cooling rhubarb sorbet and a crown of sweet rosewater foam. 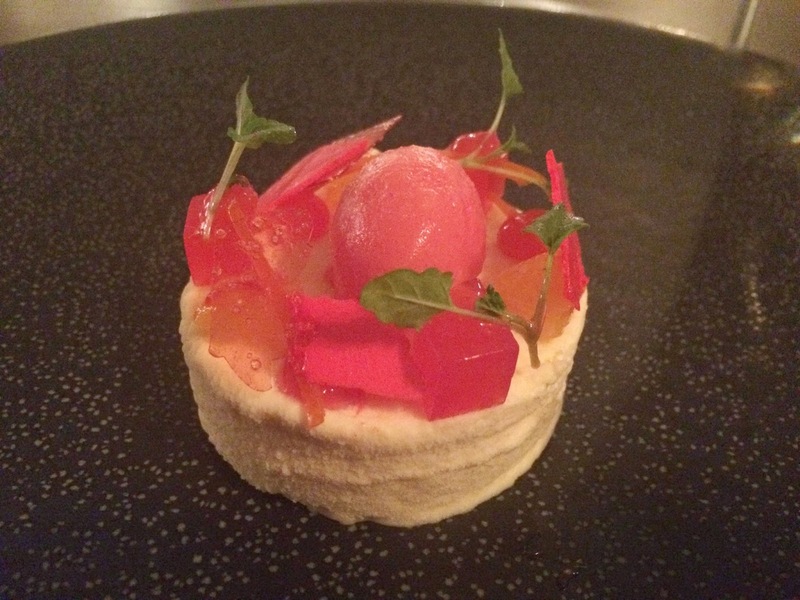 It was fabulous, and nothing could eclipse it, not even the official dessert that followed: white chocolate parfait sprayed with orange and white chocolate emulsion, with tiny variations of blood orange, confited, geléed, sliced, and tiny shoots of lemon balm. It didn’t end there. 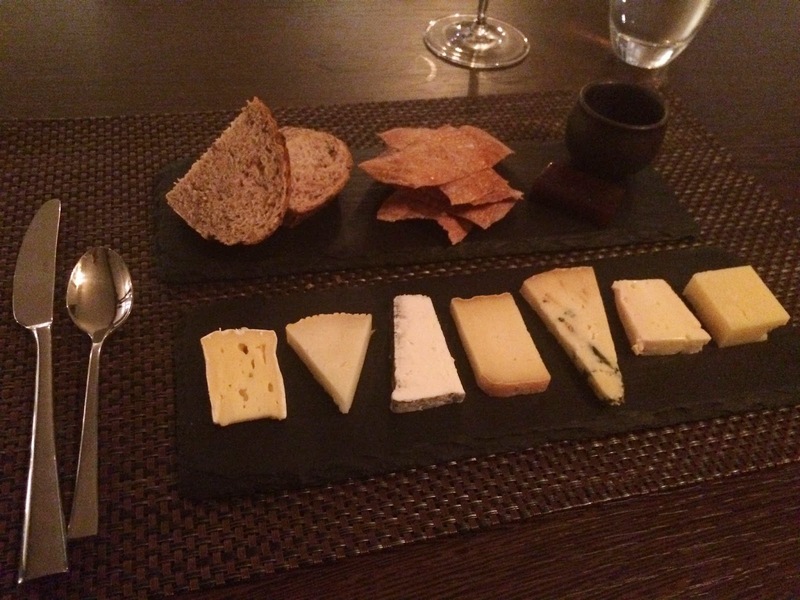 My persuasive waitress seduced me into cheese – a selection of seven English varieties, served with a sensuous Shiraz from grapes grown on the cliff face of Mount Langi Ghiran near Melbourne (you see, Mr Dennison, I was listening). As to the cheese, the waitress knew the qualities and origins of every specimen, from mild to deadly, right down to the source of the fig jelly and honey that accompanied them (and which to have with each cheese - she had clearly tried them all). It was a tour de force of a performance, so different from this time last year. All in all, a really impressive meal. I don’t give out 6 stars that easily, and those that get them normally have at least one from Michelin as well. It’s only a question of time. Congratulations to the Atkinsons – and Happy Birthday. When you are invited somewhere, is the visit still a secret? Hopefully, which is why I always book under a false name, though I suspect some chefs do know my face by now - I've been doing this job for nearly 3 years. On invited revisits (usually because the place considers that they have improved and want me to come and check), restaurants do occasionally offer to pay for my meal, however for first reviews I always insist on paying the bill, even if a restaurant recognises me when I arrive.